Since August of this year, a group of robust beings has been actively resisting Kinder Morgan's plans to drill, deforest and construct in the Burnaby Mountains conservation area in preparation for a set of tar sands pipelines. Although a mere facet of the company's plan to expand the tar sands operation and extend their already 714 mile pipeline that shadows Strathcona County, Alberta and Burnaby, the continual desecration of Vancouver's mountainous landscape is necessary to complete a twinned pipeline that would increase the nominal capacity of the network of tar sands pipelines from 300,000 to 890,000 barrels per day. The Burnaby community, Tsleil-Waututh Nation and other First Nation BC groups, and the City of Burnaby itself have garnered support through treesits, blockades, protests, and legislative rebuttals, and, as of November 28, have successfully evicted survey and drilling equipment from the site. The peaceful resistance has erupted into several arrests, including that of children and elders, and shall continue as the caretakers organize against Kinder Morgan, the National Energy Board (NEB), and the BC judicial system--whose attempt to strip the land and the voices of its protectors has not ceased. Rising Tide Coast Salish Territories reports that protesters have used bicycle locks to lock themselves to a Kinder Morgan facility in Burnaby, in unceded Coast Salish Territories in so-called British Columbia. Kinder Morgan has begun surveying and cutting trees in conservation and parkland on Burnaby Mountain, unceded Coast Salish Territories. The giant US oil pipeline company plans to clear parkland in preparation for boring a tunnel through the Northridge of Burnaby Mountain contrary to city bylaws. Activists installed a “pipeline” early this moring in front of the downtown offices of McElhanney mapping. The adhoc group says the company was tageted for its part in surveying for the controversial Kinder Morgan pipeline expansion plan on Burnaby Mountain. Texas-based Kinder Morgan has hit several Burnaby residents and two SFU professors, who have spoken out against the company’s pipeline test work on Burnaby Mountain, with a multi-million-dollar lawsuit according to the defendants’ lawyer. In a shocking display of cruelty and disregard for life, a video released yesterday exposes a contractor running into a protestor with his pickup truck, and apparently attempting to run over the protestor completely. The video reveals a protestor getting in front of a stopped pickup truck in order to take down the license plate. The truck then clearly speeds up, hitting the protestor in the stomach and almost knocking him down. Rather than slow down or stop after the first hit, the truck speeds up faster in an apparent attempt to run over the protestor. An injunction and a $5.6-million civil suit in damages is what corporate energy giant Kinder Morgan is seeking against blockaders at a court hearing this week. Sirens are blaring on Burnaby Mountain this morning as the Canadian RCMP storm the blockade against the TransMountain pipeline. 9 am update from Burnaby Mountain. Four arrests confirmed including two caretakers who have been holding down for months Kaleb and Erin, six additional people are holding in the campsite and refusing to leave. There is a public rally—which is completely safe—on the other side of the police line, 30-40 people are here already, everyone please come to the hill. Police have blocked road to traffic so you need to walk in and you will be informed to stay within ‘protest area’. After a dramatic police attack on Burnaby Mountain during which twenty four people were arrested, protestors stood strong throughout the day today, blocking trucks from entering the Kinder Morgan site. Organizers are calling for more people to come and get involved. Eight more people were arrested today while blocking trucks sent by Kinder Morgan to begin work on the TransMountain Pipeline, which threatens to triple the amount of oil sent from the most environmentally destructive project on earth, the Alberta Tar Sands, to the Pacific Coast. 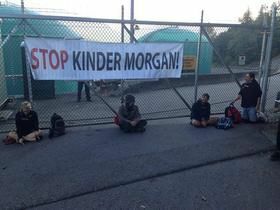 Kinder Morgan has stopped drilling on Burnaby Mountain and will move out its equipment beginning today, a company spokeswoman said Friday. An application by Kinder Morgan to extend an injunction keeping protesters away from two drilling sites for its proposed oil pipeline was rejected by the B.C. Supreme Court on Thursday. It means the site must be cleared of excavation work by Dec. 1., the date when the injunction is set to expire. We already harmed nature so much that every year we suffered from different types of calamities. Temperature of the atmosphere is increasing slowly- slowly. Instead of planting tress we are cutting them very fastly. The activists are protesting for the right cause. Dig pipeline somewhere else, leave these natural habitats if we want that our children's can also live their life as we are living. Otherwise our children's will see these things as a extincted species.